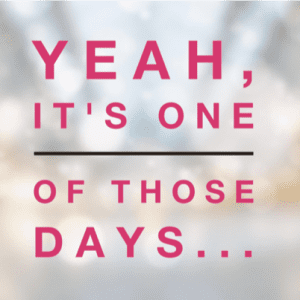 Home » Motivational Monday » Motivational Monday: One of those Days! When someone starts a comment with, “It’s been one of those days…,” what is the first thing that comes to your mind? From my experience, that statement often leads to a rant about all the things that went wrong and usually ends with a list of excuses for why that person either did or didn’t do something. Have you ever witnessed this? When my husband came home on Friday afternoon his first words to me started with, “It’s been one of those days…” I held my breath for a moment waiting for what he was going to say next. He finished his sentence with,” When everything has gone right!” My hesitancy quickly turned to relief. It then occurred to me, why do we automatically associate that statement with a bad day? Why do we often forget to celebrate the things that go right? I believe one of the biggest problems in our culture today is the attention we give to everything that goes wrong. The primary focus in the news tends to be on all the bad things that have happened. How often do you see an article or a news segment about all the good things that happened that day? While those stories do exist, they are certainly less frequent than the negative reports. In my blog a couple weeks ago, I mentioned the #somethinggood campaign that the Life is Good company is launching. I applaud this conscious effort to request to hear more about what is good and what went right! While some people might consider the “Law of Attraction” to be “woo-woo,” scientific research continues to prove it is just as real as the Law of Gravity. A simple definition of the Law of Attraction is, “The ability to attract into our life whatever we are focusing on.” Earl Nightingale refers to it as “We become what we think about.” Based on this theory, it makes sense if you are focusing on all the bad things that are happening to you in a single day, then you are likely to attract more of those types of things. The opposite is also true, if you focus on all the good things that are happening, then you will experience more good things. 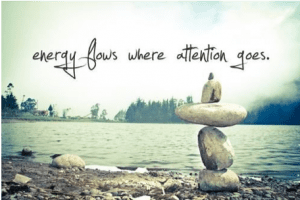 My mentor, Mary Morrissey, teaches “Energy flows, where attention goes.” If we want to change the results in our life, we need to change where we are putting our attention. 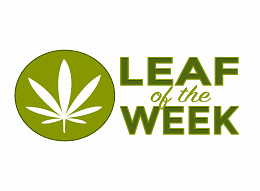 I would like to challenge you this week with an experiment. Pay attention to all the things that are going right. When something happens that might seem like a “bad” thing, offset that thought by thinking about something that went right. Sometimes it might be a simple as “I hit all green lights and got to my appointment 5 minutes early.” If you want to have more days when everything goes right, start by focusing on all the things that are going right! This might seem very simple, but when you start to pay attention to your thoughts it can make a big difference. By practicing this, you too will be singing that Van Morrison song! Every day this week, write down at least 3 things that went right that day. Listen for someone to say to you, “It’s been one of those days…” and then ask them about it and notice what they are focusing on. If you find yourself saying, “It’s been one of those days…” Stop and remind yourself to find at least one thing that went right!